Interesting option to devote some time swimming in Valencia. Is it not your first time here? Tell us how it went using the Facebook comments below or contacting us directly! 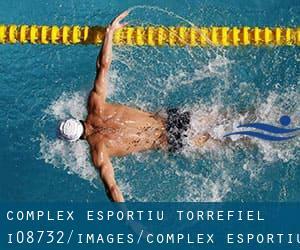 Complex Esportiu Torrefiel is only one of all the swimming pools Swimia is providing you, and its data has been shared with us by a swimmer like you.Remember you are able to now promote Complex Esportiu Torrefiel by sharing this page with your friends, adding comments and linking to us. This sports center gives 25 meters x 12.5 meters, 6 lanes, 1.4 meters - 1.8 meters depth, 1.4 meters - 1.8 meters depth, Indoors. For this Swimming Pool, only phone number is number here. What will you uncover there? Do you'll need to get in touch with them? Updated on 2019 Camino Vera, 14 , Valencia , Spain (Postal Code: 46021). This sports center offers Olympic size, 6 lanes, Indoors. Contact data for this Swimming Pool like phone number and email address are number. Updated on 2019 C/Sueca nº 25º1º B D , VALENCIA 46006. This sports center delivers wp_turia.png. Contact information for this Pool including phone number and email address are number. Updated on 2019 Azagador de las Monjas 10 , Valencia , Spain (Postal Code: 46017). This sports center gives 25 meters, 6 lanes, Indoors. For this Swimming Pool, only phone number is number here. Updated on 2019 Paseo de la Alameda, 21 , Valencia , Spain (Postal Code: 46010). Among all the activities provided by the center, if you're enthusiastic about swimming you can expect to appreciate 25 meters, 8 lanes, Indoors. Just in case you want to make contact with this Swimming Pool before dropping by, we only know the phone number. Updated on 2019 Paseo de la Petxina, 42 , Valencia , Spain (Postal Code: 46008). This sports center offers 25 meters, 6 lanes, Indoors. Contact data for this Swimming Pool such as phone number and email address are number. Updated on 2019 Avinguda de Pío XII, s/n , Valencia , Spain (Postal Code: 46015). This sports center delivers 25 meters, 6 lanes, Indoors. For this Pool, only phone number is number here. Updated on 2019 San Vicente de Paúl 10 , Valencia , Spain (Postal Code: 46019). Swimmers like you reported 25 meters, 6 lanes, Indoors. Unfortunately we do not have the email address of this Swimming Pool, but we can give you the phone number. Updated on 2019 C/ Jerónimo De Monsoriu, S/N, 46022 Valencia. Few days ago a standard user of this center told us they offer 25 meters, 6 lanes, Indoors. Furthermore, they keep in good conditions 12.5 meters, 1 lanes. Contact facts for this Swimming Pool for example phone number and email address are number. Updated on 2019 Calle de Trafalgar, 34 , Valencia , Spain (Postal Code: 46023). Swimmers like you reported 25 meters x 12.5 meters, 1.6 meters - 1.8 meters depth, 1.6 meters - 1.8 meters depth, Indoors. Unfortunately we do not have the email address of this Pool, but we can give you the phone number. Updated on 2019 Calle San José , Benimamet , Valencia , Spain (Postal Code: 46035). This sports center delivers 25 meters x 16 meters, 8 lanes, Indoors. Contact data for this Swimming Pool for example phone number and email address are number. Updated on 2019 Parque Nazaret , Calle de la Macarena , Nazaret , Valencia , Spain (Postal Code: 46024). This sports center delivers 25 meters x 16 meters, 8 lanes, Indoors. For this Swimming Pool, only phone number is number here. Updated on 2019 Calle de los Santos Justo y Pastor, 4746022 ValenciaEspaña. Swimmers like you reported 25 meters, 4 lanes, Indoors. Phone number and e-mail address are number for this Pool. Updated on 2019 Calle Economista Gay , Valencia , Spain (Postal Code: 46009). Swimmers like you reported 25 meters x 16.5 meters, Indoors. Unfortunately we do not have the email address of this Swimming Pool, but we can give you the phone number. Updated on 2019 Avda. Hermanos Maristas, 18 , Valencia , Spain (Postal Code: 46013). This sports center gives 25 meters x 12.5 meters, 6 lanes, Indoors. For this Swimming Pool, only phone number is number here. Updated on 2019 C/ Alberique 18 46008, Valencia. This great and large sports center lets professional swimmers like you enjoy Olympic size x 10.5 meters, 5 lanes, Indoors. Additionally, within these facilities you can try 25 meters x 10.5 meters, 5 lanes, Indoors. Phone number and e-mail address are number for this Swimming Pool.